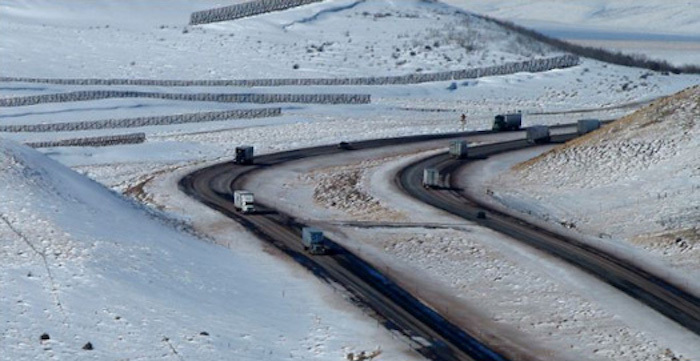 As it prepares for winter, the Wyoming Department of Transportation (WYDOT) has been demonstrating the new connected vehicle technology that it is piloting on Interstate 80, which it hopes could help reduce crashes and make the route safer during adverse weather conditions. In 2015, WYDOT received a grant from the US Department of Transportation (USDOT) to develop and participate in the agency’s Connected Vehicle Deployment Program. Wyoming was one of only three locations in the country to participate in the scheme, with the other pilots taking place in New York City and Tampa, Florida. At an event in Cheyenne, WYDOT officials explained how the new connected vehicle technology will communicate road information and alerts to motorists in near real-time. The agency plans to install onboard communication units (OBUs) in about 100 of the department’s vehicles and about 300 private fleet vehicles. WYDOT is also installing 75 roadside units (RSUs) on and around the I-80 corridor. Visibility issues often become a problem during the winter in Wyoming, with high winds that accompany a majority of the snow storms. At the event, WYDOT and the Wyoming Highway Patrol noted that snow plows and patrol vehicles are often hit by other vehicles because of poor visibility, and that those conditions also contribute to other crashes along the I-80 corridor. During the demonstration, WYDOT officials used several vehicles, including a snow plow and a Wyoming Highway Patrol vehicle, to illustrate how the technology enables the units to communicate with each other during: a forward collision warning, a distress notification, a construction zone notification, and weather warnings. Depending on the situation, the technology would either interact vehicle-to-vehicle (V2V), vehicle-to-roadside infrastructure (V2I) or roadside infrastructure-to-vehicle (I2V). For the V2V communications, a vehicle sends out a safety message and a nearby vehicle then receives it, allowing critical information to be shared in near real-time. For V2I communications, a vehicle that has information on an incident sends it to the RSU, which then sends it to WYDOT’s Transportation Management Center (TMC). The TMC can also send out alerts based on information collected from connected vehicles and other systems, including weather stations and reports from maintenance employees, to the RSU for onward communications to other nearby vehicles.